Observational analysis of the alterations of the social structure and housing markets of areas in inner-city London led Glass (1964) to coin the term ‘gentrification’, described as a phenomenon in which the social character of a district is transformed through the displacement of its working class inhabitants. Further research on gentrification has identified it to include factors such as the physical regeneration of housing stock and industrial areas. Above is an example of the output of a function I have been developing in R to support quantitative research in urban planning. This function provides a tool to analyse weighted combinations of different variables and how they may have changed over time – suitable for identifying scenarios such as gentrification which have no clear single identifier. 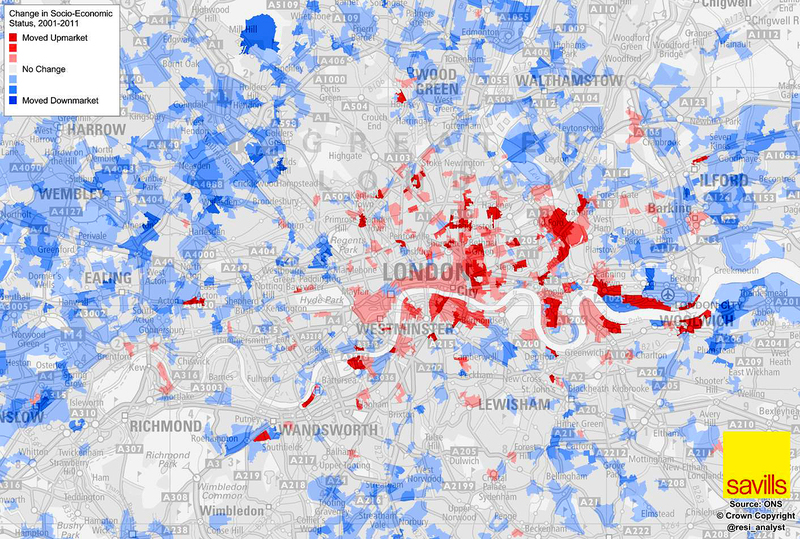 The map aims to show concentrations of areas that have experienced a significantly high change in class, in dwelling stock and property value (dark blue) over the ten year period between 2001 and 2011. A number of clear areas have been identified in the inner-east and outer-east of the city. Further information about this function and analysis of results to come. As part of my Master of Research coursework I have been developing a function in R named ‘spot-the-difference’ to support quantitative research in urban planning. This particularly supports the analysis of multivariate phenomenon (such as gentrification, segregation, migration) over time which are well-covered in urban planning literature, but their narratives often fall short in the incorporation of modern GIS technology in their analyses. R is an open-source programming language and environment that enables statistical computing and the creation of graphics supported by a wide range of geospatial packages. Perusing New Years Day on social media one couldn’t help but notice the large amount of tweets about the beginning of Season 3 of the BBC TV series ‘Sherlock’ ; nearly surpassing those of the New Year and reflections of the previous. It seemed appropriate to use some of my new social media toolkit to collect this data. From 3:00pm until midnight the data was collected – the show being broadcast from 9:00pm until 10:00pm. Below is the result showing the widespread hype throughout London during the day. Approximately 1800 geo-located tweets, which seems is only a very small subset of the tweets that actually appeared. Nonetheless an interesting map to observe (mouseover green dot to view tweet text).